Clear dish with 3 large assorted Succulents, set in a bed of river rocks with a small amount of water at the bottom of container. 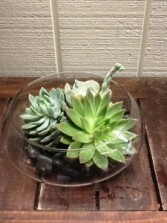 This is a beautiful and different look and the arrangement lasts for weeks!!! Be BOLD! !great for Birthdays, get wells or just because! 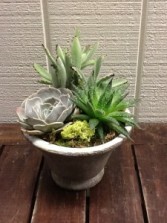 Step out of your comfort zone and surprise someone with a beautifull Living Green Succulent Garden, Large assorted living succulents in a ceramic container will lighten up any home. 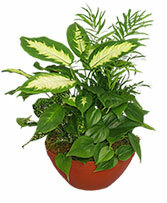 A wonderful but different gift Idea!!! 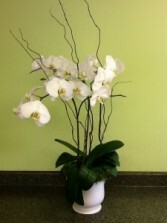 Beautiful White Phalaenopsis Orchid in a ceramic container trimmed with Willow branches and moss. 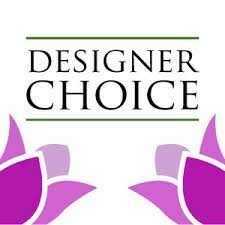 Please call to see what other color Orchids are available. 3 stem Orchid shown. 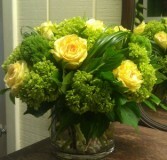 A clear cylinder vase packed with mini green hydrangea, yellow roses, green trick dianthus and trimmed with tall bear grass and beautiful foliage. 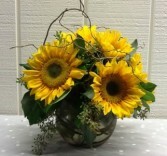 Perfect for birthday, anniversaries or anytime! 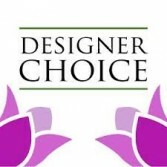 Let our award winning designers select the best and most beautiful flowers to build a one of a kind arrangement created especially for you. Your arrangement will be made with a mix of the freshest flowers available and a special touch of our designer's own creativity. A winning combination that we highly recommend! Having a hard time deciding on the perfect gift for dad? 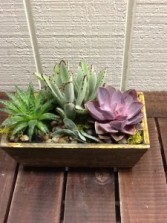 Blossoms at Dailey's Flower Shop can help! Send dad a artistically crafted floral tribute to show him how much you care. Perhaps your dad is the type that would prefer a gift basket filled with his favorite snacks! Whether your dad lives in Fairfield, or clear across the country, we've got you covered!